Green Onyx comes from a dyke quarry in Pakistan. 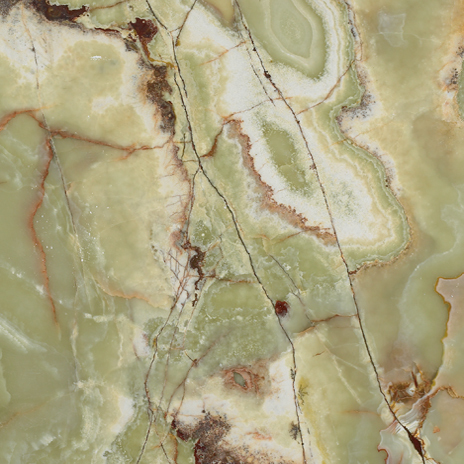 This quarry produces three color ranges, a light green, a dark green and a multi-colored onyx. 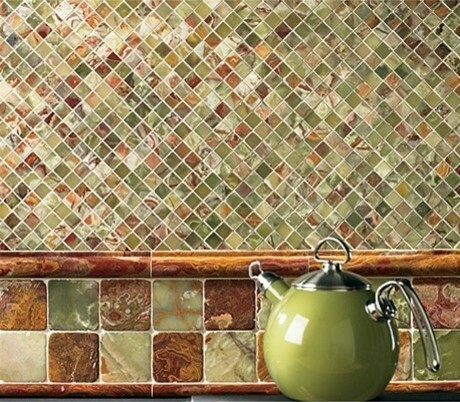 The slabs are an overall green but they have red, brown and burgundy areas that will vary between bundles along with the depth of the green tone. One of my favorite things about onyx is the transparent portions of the slab that, when back lit, will allow light to pass through, illuminating the stone. I have done projects from kitchens, vanities & desks to wall art where the onyx has been back lit. It is always breathtaking. 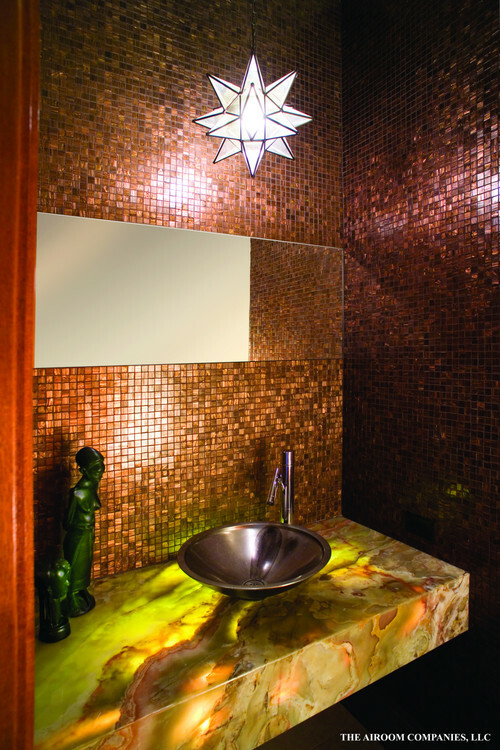 To read more about backlighting onyx go here. 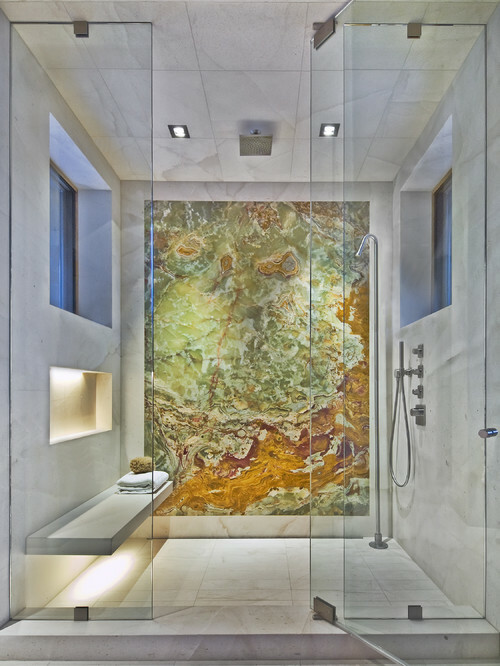 The full slab in the shower below is back lit. Amazing isn't it?!? Onyx is a very soft stone. It is not necessarily recommended for kitchens, though it has been done plenty of times! You just have to be aware of the maintenance that it will require. It's not a matter of if it will scratch, but when it will scratch. Onyx will also etch if anything acidic gets on it. 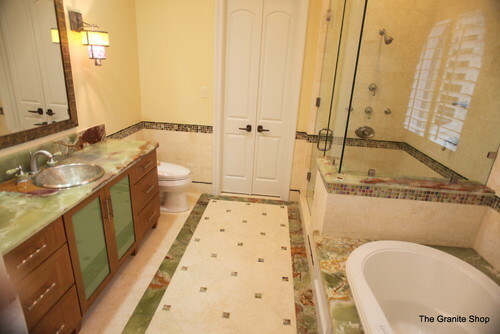 Green Onyx is used a lot for sinks, decorative accessories and tile in all sizes. Green Onyx mainly available in 2 cm slabs, though sometimes it does come in the 3 cm thickness. Is there a specific edge profile better suited to onyx? My suggestion is to ask your fabricator what edge profile they feel most comfortable doing on onyx. 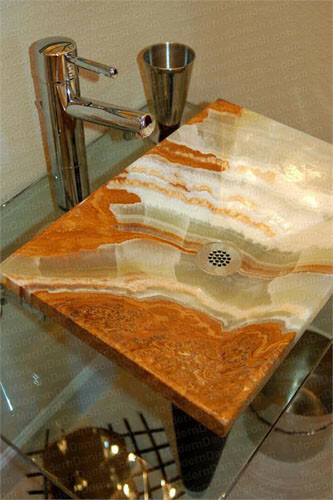 We can do almost any edge on onyx, but I have very skilled fabricators that have worked on onyx for years. If your fabricator hasn't done a particular edge on onyx I wouldn't be the test. I personally really like Ogee edges and big Mitered Aprons on onyx.